It is shown that a bright stationary light pulse evolving along the slow axis of a birefringent fiber in the anomalous dispersion regime can be locked to move in the same group velocity together with a black-soliton pulse trapped along the fast axis in the normal dispersion regime despite each individual pulse’s, in the absence of the other, propagating at different group velocities. Such a stationary copropagation of the bright and the black soliton pulses with the same group velocity in coherent trapping can sustain up to a finite distance owing to polarization modulation instability of the black-pulse background that breaks the stationary evolution into radiation. In incoherent trapping the bright–black paired soliton state also disintegrates with propagation distance, and the disintegration is accompanied by emission of bright and gray solitons that has potential for ultrafast optical switching. 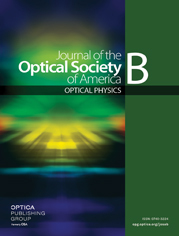 On the other hand, it is found that the two black-soliton pulses polarized along the principal axes of the birefringent fiber in the normal dispersion regime can evolve stably, in contrast to the paired spatial black solitons of different frequencies and parametric black solitons that break up with propagation distance owing to modulational instability of the cw backgrounds.